Opera Software has officially released Opera 11.11 Final a few seconds ago. The version has been available on Opera's ftp server since yesterday, and many software download portals like Softpedia or Betanews have offered the new version since then. While it may be tempting to download a new browser version a day early, it is somewhat risky considering that last minute changes or bugs might force Opera to update the version before release. This is a security and stability upgrade. 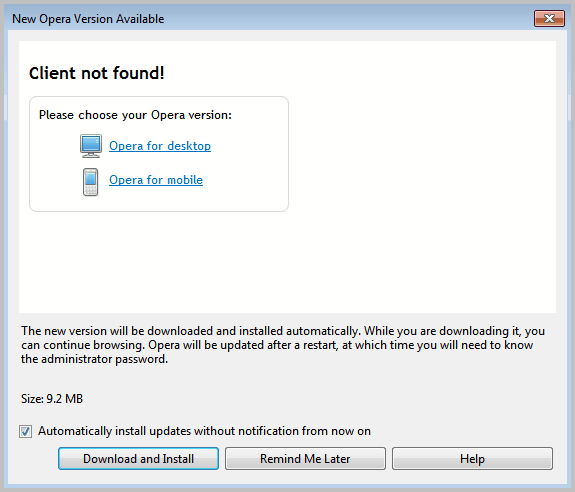 Opera users are therefor encouraged to update their version of Opera as soon as possible to improve the stability and security of their browser. The changelog lists several crash fixes and a single security issue. Some fixes of Opera 11.11 are site related, including fixes for Wikipedia, Google Calendar, Falk.de and sites that are using a specific certificate. The internal update checker may not be able to pick up the new version right away. It is therefor recommended to check for updates manually in the web browser. You do that with a click on Menu > Help > Check for Updates. Opera had problems identifying my client version, and offered downloads of the desktop and mobile version of Opera. You only have to select Download and Install if you get that screen as well. It is not necessary to make a choice on the screen. Make sure you check the version after installation of the update. You can do that with a click on the Menu and the selection of Help > About Opera, or by entering opera:about in the Opera address bar and pressing enter afterwards. Thats a lot of Opera Updates. Its still a bit dodgy on the mobile devices.